Some of the most spectacular prehistoric monuments of Wales are the coastal promontory forts on the Pembrokeshire coast. They are subjected to constant erosion; some have completely disappeared into the sea and most have been much reduced in extent. 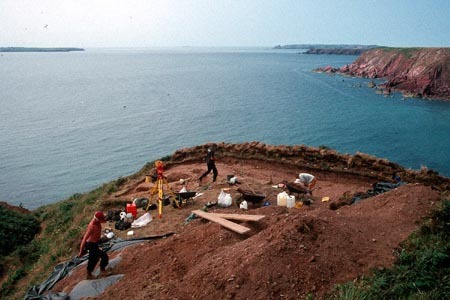 Following a 1994 Cadw-funded survey of all the coastal forts, two were targeted for excavation: Porth-y-Rhaw near St David's and Great Castle Head, Dale. Port-y-Rhaw was investigated in 1997-98 and Great Castle Head in 1999. The defensive banks and ditches at Great Castle Head survive in reasonable condition, but a massive landslip has lowered the overall land surface on the southern side by many metres, making interpretation of the earthworks very difficult. Within the defences only a small portion of what would have been a large area available to build houses now remains. Excavation concentrated on the surviving internal area, with only limited investigation of the defensive system. Owing to the small area available for excavation, it was not possible to identify round-houses or other structures, but the density of post-holes, gullies and pits indicates intensive and perhaps long-lived occupation of the site. As with other excavations on iron age forts in southwest Wales, only a few artefacts were found: a couple of sherds of prehistoric pottery, a piece of Roman pottery, and 80 fragments AD 12th - 13th pottery produced at Ham Green, Bristol. These last objects were associated with a remodelling of the defences in the Medieval Period. Radiocarbon dates indicate that the fort was constructed in the early to mid first millennium BC. A report which will contain a number of specialists' contributions is currently under production.